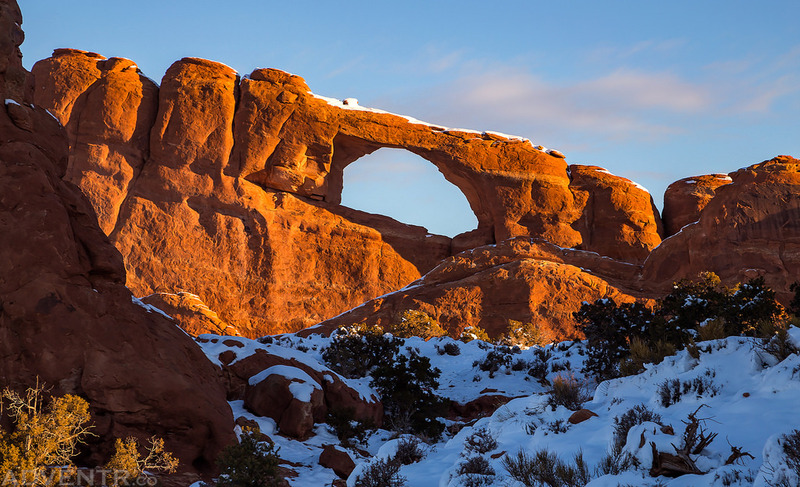 On Christmas morning Diane and I got up early, had some breakfast, loaded up the Jeep and then headed into Arches National Park for our annual Christmas tradition of hiking to Landscape Arch to make sure it’s still standing for another year. If you are interested, you can see our previous trips here:   . During our drive through the park to the Devil’s Garden Trailhead we caught a pretty nice sunrise from a few overlooks along the way. 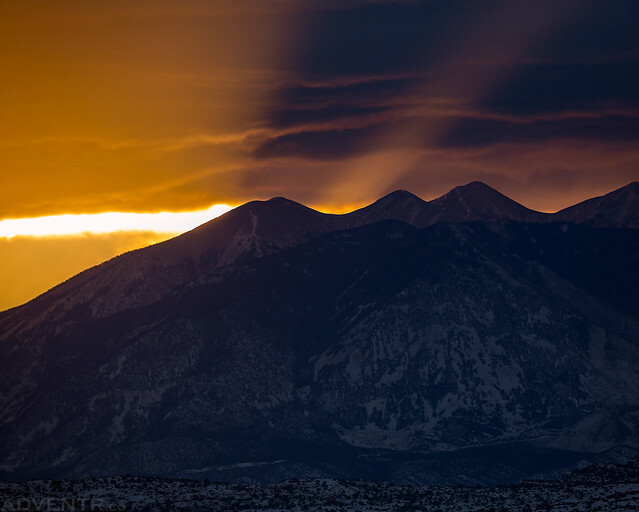 Magenta-colored light beams break through the La Sal Mountains in the distance. 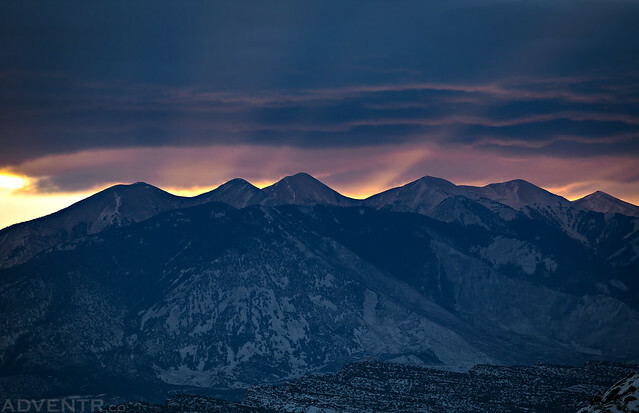 After a few minutes the magenta-colored light turned to a golden yellow and intensified. 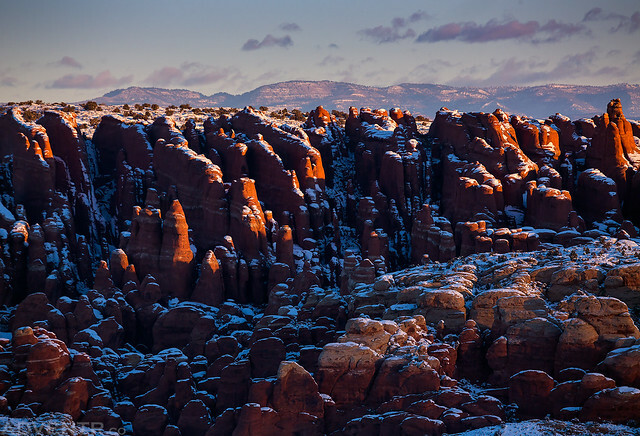 The first light of the day strikes the fins of the Fiery Furnace. 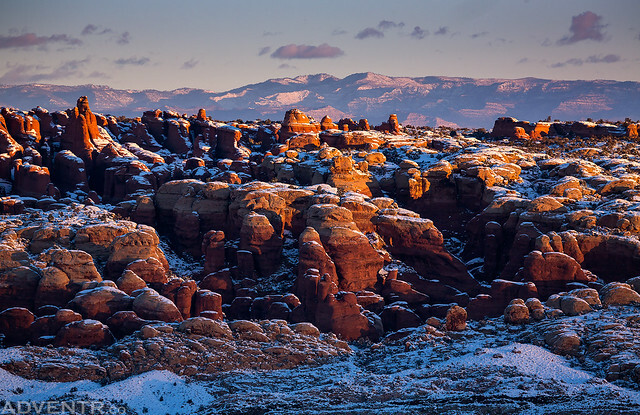 A beautiful sunrise over the Fiery Furnace with the Book Cliffs on the horizon. 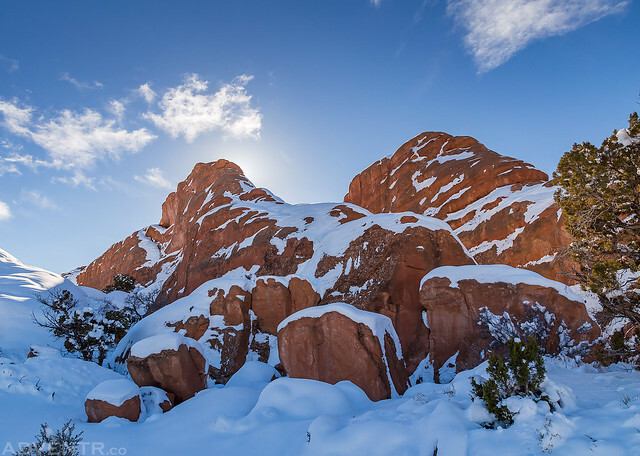 Early morning light over a snow-covered Winter Camp Ridge beyond Salt Wash.
Beautiful golden light over Castle Valley. If you look closely you can just make out the top of Castle Rock (Castleton Tower). We made a quick stop at Skyline Arch since it was looking good in the early morning light. 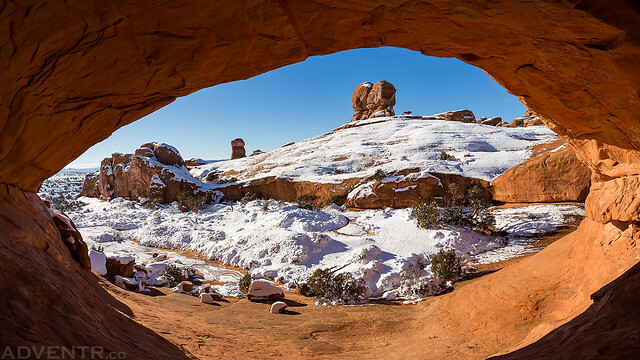 After stopping a few times for photos of the sunrise along Arches Scenic Drive, we did eventually make it to the Devil’s Garden Trailhead where we started hiking down the snow-packed trail to Landscape Arch. It was early enough in the morning that we didn’t pass anyone else along the way. 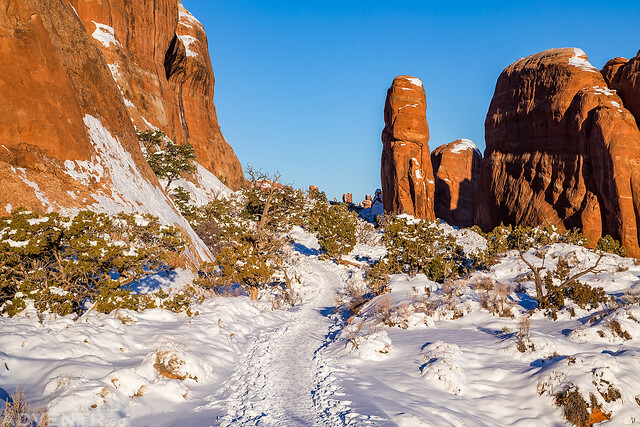 Hiking the snow-packed Devil’s Garden Trail on our way to Landscape Arch. Diane hikes ahead of my as we near Landscape Arch. It looks like Landscape Arch is still standing after another year on Christmas Day, 2017. We had the arch to ourselves for a little bit and then returned the way we had come. We decided not to visit any of the other nearby arches this time around. 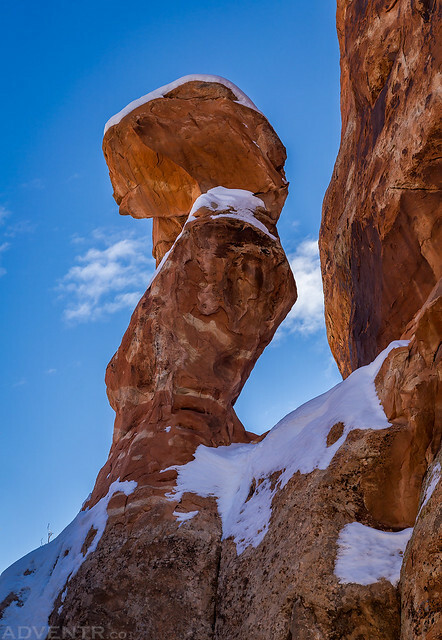 A sandstone serpent covered with snow. Next we headed over the the Eye of the Whale trailhead where I had hoped we could explore some of Herdina Park. First, we hiked into the Eye of the Whale and it appeared that we were the first people to visit since the snow had fallen. 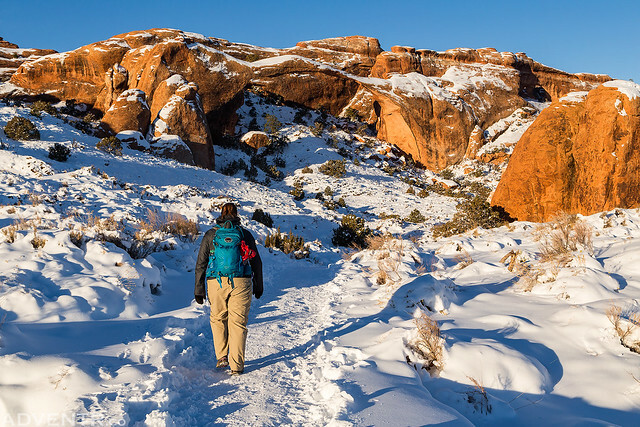 We soon realized that it would probably be too treacherous to hike around on the steep sandstone covered with snow and ice, even with our microspikes, so we cancelled those plans and will return to the area when it is snow-free. We did go for one more short hike along the outer edge of Herdina Park so we could visit Leaping Arch before we left. 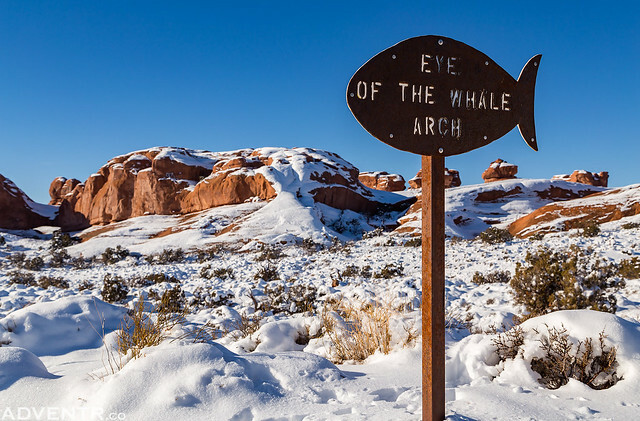 At the Eye of the Whale Arch Trailhead near Herdina Park. The view from within the Eye of the Whale. Snow-covered fins along the edge of Herdina Park. A view of Leaping Arch from below. 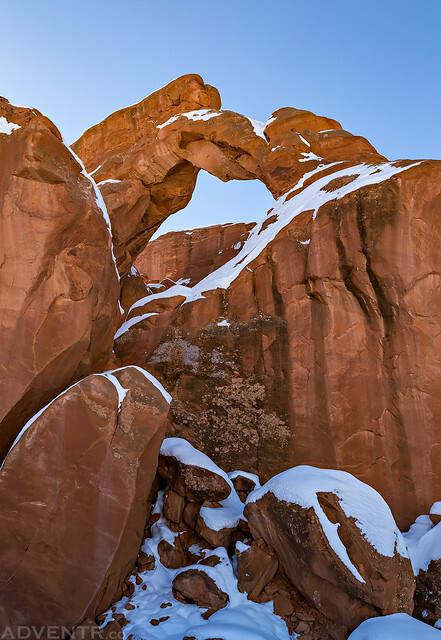 By the time we returned to the pavement, Arches was starting to get busier and since I didn’t have any intentions of sticking around for sunset this evening, we decided to call it a day early and headed home. This would give us a little time to relax before going back to work on Tuesday. Your photography and stories are all so wonderful! 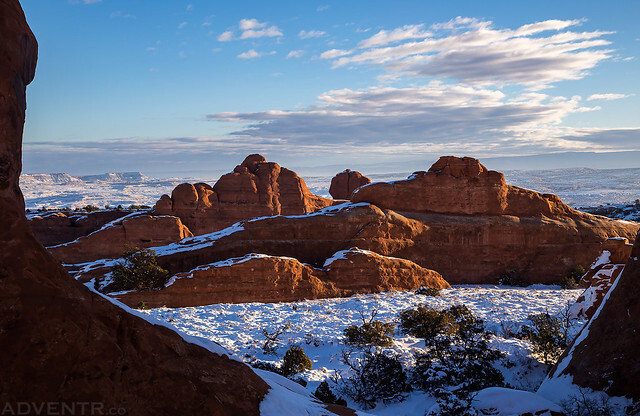 And it looked like a beautiful time to see Arches. Thank you for sharing. We missed you by a day! We went up to Moab the 26th through the 30. The snow was beautiful! I go every year for Christmas!